Have you ever thought about whether you want services or products as your career focus? Understanding the differences between these two possibilities can help you to choose or change to a work direction that is best for your interests, personality, and skills. I interviewed people with both of these types of careers to get their perspective about their day-to-day experiences with their jobs. Sara Martin is an artist, writer, and designer. Ms. Martin describes herself as a “creative, expressive person,” and she says her years in business have taught her how her business model affects her satisfaction with work. 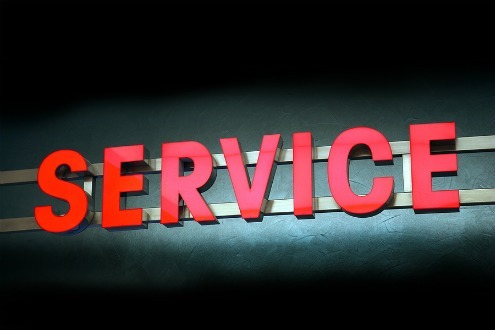 “In a service business, your job is to facilitate the success of your clients. Their success is your success. The client gets to set the metrics for what constitutes success. You, the service provider, may develop opinions about the best course of action for your client, but at the end of the day, it’s not your call. This business model is great for people who enjoy solving puzzles, or finding many possible solutions to a given problem. If your creativity is satisfied when you solve a problem for someone, this model will work for you. So what do you think? Do you work in a service-focused job, a product-focused job, or both? Do you like it? What should others know to make the best career decision? I think John Tschohl made a good point. The best product-based businesses always have fantastic customer service. I think that’s an important aspect of business to remember. No matter what you do, you always have to serve a customer/client the best you can to succeed. Excellent customer service is the best form of advertising. I always aim to exceed customer expectations…. and provide a service second to none. The thing is a product is only as good as the service provided. If you have an issue which is inevitiable with any product – a CV or a car – then you want a prompt response that resolves your issue quickly.